1. Do you like your name? Were you named after someone? If you have children how did you settle on their names? I do like my name. I can't imagine having a different one! I wasn't named after anyone; I'm not sure why my parents named me what they did. As for my boys, my oldest was named for my FIL (first and middle names), my middle was named for CH's best friend (first name) and my BIL (middle name). My youngest was named (are you ready for this? )...after our next door neighbors in Ga. We were a very close-knit neighborhood; most of us were starting our families or were getting married. It was almost all of our first time as being home owners. Anyway, when YS came along, we tried out many, many names. We were really having problems trying to figure it out. I have kind of weird names in my family, and I just didn't like any of them for our baby. So, one of my next door neighbors said, "I know...what about Terry Randy" (the first names of our neighbors). So, we started trying different combinations, and came up with using their last names (which can be used as first names). And that's the story of how YS got his name. Aren't you glad Joyce asked that question? 2. How do you define success? Being happy with what you have and who you are. 3. Wheel of Fortune or Jeopardy? Oooo, that's a tough one. It depends on my mood, really. When CH & I were first married, they were both the only form of entertainment we had since we were poor newlyweds! 4. If you could own any single object that you don't have now, what would that object be? 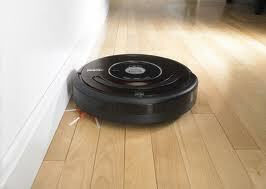 I don't know that there is anything I want...maybe one of those iRobots...now that would be nice! 5. What is something that inspires you? Reading other people's blogs. Seriously. You people inspire me! 6. Meatloaf-yea or nay? If its a yay how do you make yours? 7. Which is more admirable-the ability to organize and be methodical or the ability to adapt and make do? Phase 2 of redoing the bathtub is almost complete! One of my nephews (who is in grad school) is tackling the tile around the bathtub for us. He has redone his parents' basement and is getting ready to redo their kitchen. We're talking major overhaul. Anyway, the concrete board has gone up around our bathtub, the tile is next! We're going to do something with the bathtub...it'll be white when it's over and done. Hopefully we aren't doing this backwards by doing the tiling first and then the tub! I'll be so incredibly happy when the whole bathroom is done! YIPPEE! I've never tried the mini meatloaves...I'll check it out. Room redos are always a pain while in progress but it will feel great to have a nice new bathroom! Thanks for the recipe link. I can't wait to see your room when you are done. Oh man...I forgot about the robot vacuums!! I totally need one with the number of dogs that live in my home!!! I'm thinking it would help me divide up the meatloaf in portions for our family. Must check out the mini meatloaf idea. Congrats on the bathroom redo, this is fun stuff....love getting the house updated! I think I would wear out one of those Irobots in no time!!! Glad you like your name, I have always liked mine. Perfect answer for #2. I don't watch anymore but I always liked Wheel of Fortune. How sweet that you have been inspired by reading blogs. I do know that bloggin has changed my life in a wonderful way. Enjoyed reading your answers. Enjoy the rest of your week. I'll have to try that meatloaf muffin recipe! And I'd love to see the finished bathroom, too! :-) You're so brave!